U.S. workers are more productive today than at any time in recorded history. Because of this unparalleled productivity, corporate profits have reached an all-time high. Workers are not seeing the benefits of these gains, however, as real, inflation-adjusted wages have not increased in decades. The only families that have seen income growth since the 1970s are married-couple families where both parents work, and those gains are only possible by adding a second paycheck, because in most cases a single breadwinner can no longer keep an entire family afloat. So employees today are working harder than ever before and bringing in record profits for their employers without commensurate increases in their own salaries. Perhaps workers are trading higher wages for greater access to benefits that allow them to better balance their work and home lives, especially given the fact that they are working longer hours without the benefit of a full-time, stay-at-home partner? After all, one survey found that 45 percent of workers said that they would accept a lower salary in order to obtain a better work-life balance. Unfortunately this does not appear to be the case, since 36.1 percent of all U.S. workers lack access to any form of paid leave—including 42.9 percent without a single paid sick day and 39.2 percent without any paid vacation—and 44.2 percent do not have access to any form of workplace flexibility. That means that for millions of workers, getting the flu means either losing a day’s pay or potentially losing their job. It means that instead of being able to alter a shift’s start or stop time while working the same number of hours, these workers have to forgo attending their children’s parent-teacher conferences, recitals, and sporting events. And while some of these workers are high-powered professionals who need to be at work lest the rest of the office shuts down in their absence, the painful truth is that the majority of those who lack any access to paid leave or flexibility are lower-wage workers with less than a college education. The United States is the only advanced economy in the world without national policies to help workers balance employment with the rest of their lives. For one, the United States is the only member of the Organisation for Economic Co-Operation and Development that does not guarantee paid leave to workers after the birth of a new baby, leaving us in the company of Papua New Guinea and Liberia. What’s more, the United States is among the handful of countries that does not guarantee workers the right to paid leave when they are too ill to work, alongside countries like North Korea and Chad. As all of the other countries who do offer these benefits show, there is a better way. Legislation like the Healthy Families Act, which would allow workers to earn up to seven paid sick days per year; a national paid family and medical leave program like the one proposed by the Center for American Progres; and workplace flexibility initiatives like those promoted by the Obama administration would all help bring our labor standards up to the rest of the developed world’s. This issue brief details the importance of access to paid leave and workplace flexibility, as well as discrepancies in access to these policies based on one’s gender, race, income, age, and educational attainment. Every worker potentially needs access to paid leave or workplace flexibility at some point in her or his career. Short-term illnesses can prevent employees from being physically able to work, and the Centers for Disease Control recommend that workers stay home when they come down with illnesses like the flu. Even if a worker is lucky enough to never get sick, however, they may need to leave work to go to a dental appointment, to stay home to care for an ill family member, or to wait for someone to come and repair the washing machine. In an ideal world, an employee who could not come to work would have two options: either use paid leave so that they did not lose wages or utilize workplace flexibility so that they could work from home or alter their schedule so that they worked the same number of hours but with a different start and stop time. Some workers are lucky enough to be able to choose between these two options—34.7 percent of workers have access to at least some form of paid leave and some form of workplace flexibility. But 15.1 percent have access to neither, which means that they are left with no options when they are sick, when they welcome a new child into their family, or when they cannot be at work for some other unexpected but serious reason. If we compare the workers who have no options for paid leave or flexibility to those who have access to both, some stark differences emerge. In 2011 women made up 48 percent of all workers but were less likely than men to have access to both paid leave and workplace flexibility. (see Figures 1a and 1b) There are a few explanations for this glaring imbalance. Men are more likely to have higher-paying jobs, which typically have better access to benefits like paid leave and flexible scheduling. The median usual weekly earnings were $832 for men and $685 for women in 2011. Among male and female workers earning in the top 10 percent, men were still more likely to have higher-paying jobs: On average, men made $1,914 per week in 2011 while women in the same group earned just $1,515. Men are also more likely to work in management, business, and financial occupations, which are more likely to offer paid leave and flexibility, while women are more likely to work in service occupations, which have some of the lowest rates of access to paid leave and flexibility. While more women are employed at or below the federal minimum wage—2.4 million to men’s 1.4 million in 2011—in jobs that would have less access to benefits, they are more likely to leave a job when a new child arrives. Women are also more likely to be employed part time. In addition to tending to have lower salaries, part-time jobs generally have little or no access to benefits. Of all workers age 18 and older (both full time and part time), 72.1 percent are white, 13.2 percent are Latino, 10.8 percent are black, and 3.8 percent are Asian American. 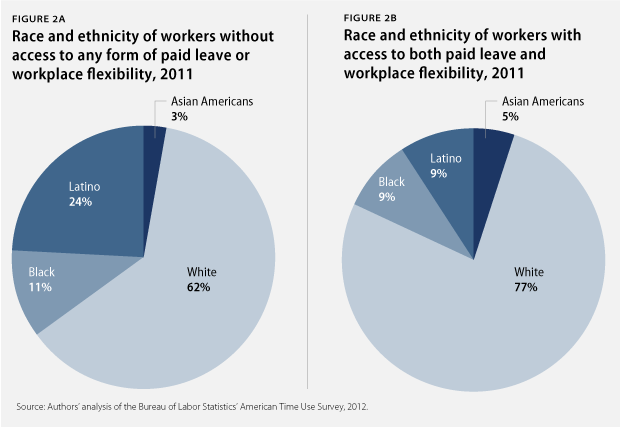 Access to paid leave and workplace flexibility, however, varies greatly across race and ethnicity. As shown in Figures 2a and 2b, white workers are disproportionately more likely to have access to these benefits—they make up 77 percent of workers with access to both paid leave and flexibility and only 62 percent of workers without access to either. Asian Americans are also more likely to have access to these benefits—they make up nearly 5 percent of workers with access to both benefits despite making up less than 4 percent of the workforce. 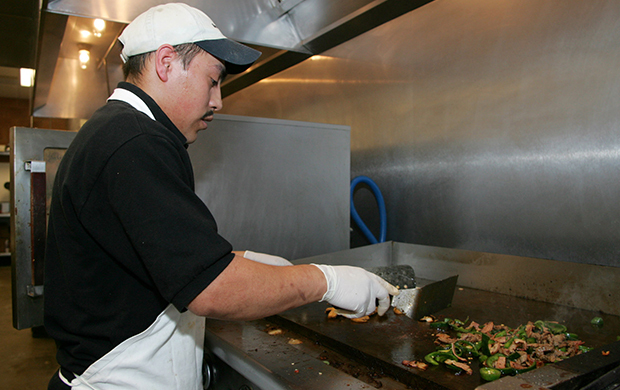 One reason for this may be that Asian Americans are less likely to work part time. While close to 20 percent of whites, Latinos, and blacks work part-time, only 14 percent of Asian Americans report doing so. Latinos are the least likely to have access to paid leave or flexibility of any race or ethnicity. Despite comprising less than 15 percent of all workers, they make up 24 percent of those without access to any form of paid leave or flexibility and just 9 percent of those with access to both. Black workers are also less likely to have access to paid leave and flexibility—although they comprise 10.8 percent of all workers, they only make up 9 percent of workers with access to paid leave and flexibility and almost 11 percent of workers without access to either. 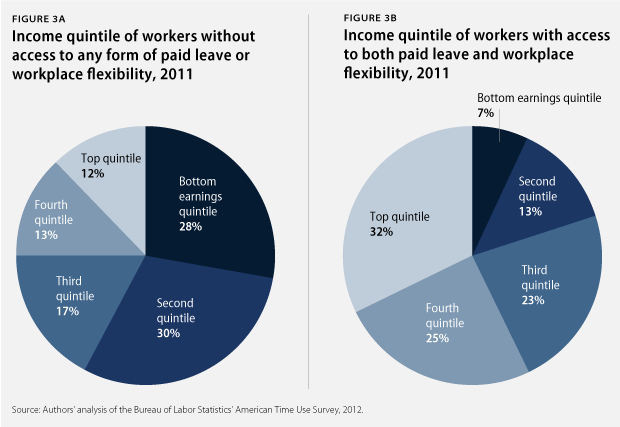 Workers in higher income brackets are more likely to have access to both paid leave and workplace flexibility than those earning less. (see Figures 3a and 3b) Workers in the bottom 40 percent of earners are more than twice as likely as workers in the top 40 percent of earners to lack access to any form of paid leave or flexibility. Workers in the bottom 60 percent of earners make up three-quarters (75.3 percent) of all workers without access to paid leave or flexibility but only 43 percent of workers with access to both paid leave and flexibility. Our nation’s top earners—those making more than 60 percent of all workers—comprised 57 percent of the workers with access to both paid leave and flexible scheduling. Workers earning between 40 percent and 60 percent of earners made up another quarter (22.4 percent) of workers with access to both paid leave and flexibility. Americans on the lower rungs of the income ladder—in the second-lowest income quintile—comprised just 13 percent of workers with both of these vital benefits. And those earning the very least—workers in the bottom 20 percent—were only half as likely as those in the quintile above them to have access to both benefits. Unfortunately those earning the least are also oftentimes the ones in greatest need of policies like paid leave and flexibility. For Americans earning the minimum wage or less, the line between just getting by and destitution can rest on just one day’s pay. 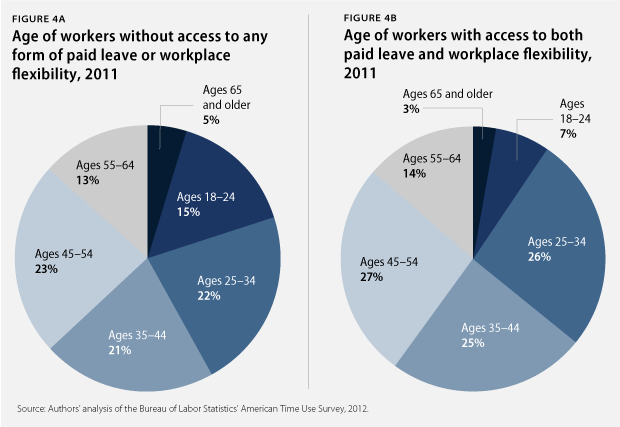 After breaking down workers by age group, there is little variation between workers with access to both paid leave and flexibility and those without access to either except among those ages 18 to 24. Young workers make up only 7 percent of those with access to both paid leave and workplace flexibility but make up more than 15 percent of those without access to either. Workers between the ages of 25 and 54 are all equally as likely to have access to paid leave and flexible scheduling at work—these groups each make up between 25 percent and 27 percent of the total. We see a similar story among those workers without any access to these benefits. Workers between the ages of 25 and 54 make up exactly two-thirds of all workers without any form of paid leave or flexibility, and the three age groups encompassed in this age range are more or less evenly divided. Workers ages 55 to 64 make up around 14 percent of both groups. A worker’s level of educational attainment is another strong predictor of his or her access to paid leave and workplace flexibility. (see Figures 5a and 5b) Workers with access to both paid leave and flexibility are more likely to have some college education (29 percent), a bachelor’s degree (29 percent), or a postgraduate degree (16 percent). Those with less than a high school diploma make up only 2 percent of workers in jobs with these benefits. Given that higher levels of education generally translate to higher salaries and better-quality jobs, these trends make sense. Fifty-three percent of workers without access to any form of paid leave or flexibility have only a high school diploma or less. Those with postgraduate degrees make up just more than 7 percent of workers without these benefits and those with a bachelor’s degree make up just more than 14 percent of the total. Workers with some college education comprise the remaining quarter of workers without access to paid leave or flexible scheduling. Workers who lack any form of paid leave or workplace flexibility are predominantly those who are younger, less educated, and in low-wage jobs. People of color are also disproportionately likely to lack access to these benefits, although white workers still make up the majority of those without paid leave or flexibility. This becomes of greater concern as we look at prospects for job growth in the United States over the coming years and decades. Low-wage jobs made up 21 percent of all job losses during the Great Recession of 2007–2009 but have made up nearly 60 percent of job gains during the recovery. Furthermore, Bureau of Labor Statistics projections for the fastest-growing occupations include personal care aides and home health aides—two relatively low-wage jobs. The average salary of the top 10 fastest-growing occupations is $36,500, which is just above the median annual wage in 2010 of $34,000. These projections underscore the importance of policies that require employers to provide employees with paid leave and flexibility. Low-wage workers are not less likely to get sick than highly paid professionals, though they are more likely to work in service occupations that put them in direct contact with the public. And people with less education are not less likely than college graduates to need to take time off from work to care for a new baby or an elderly parent. These discrepancies in access do not reflect need, and they place low-wage workers, young workers, and people of color at a distinct disadvantage. Legislation like the Healthy Families Act, a federal paid family and medical leave insurance program, and workplace flexibility initiatives like those proposed by the Obama administration would go a long way in beginning to rectify these inequities in the workplace. Sarah Jane Glynn is a Policy Analyst and Jane Farrell is a Research Assistant for Economic Policy at the Center for American Progress.